I have a huge crush on Jacques Pépin. Do you know this dude? If not, check him out. It is mesmerizing to watch him prep vegetables. 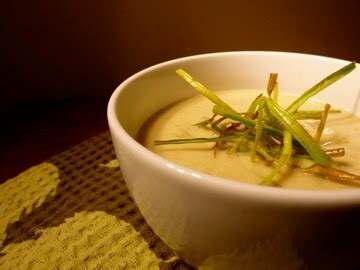 Anyway, he’s passionate about not letting stuff go to waste, and because of this, I think he might fancy my Braised Leek and Bacon Bisque. I use two parts of the leek, and any leftover trimmings can be cleaned and frozen, and tossed into a pot the next time you make stock. Anyhow, the leeks are braised with a bit of bacon fat and a lemon thyme stock, pureed, and then topped with crispy fried leeks. It is mighty tasty! Prepare the leeks. Trim the root and dark green ends and set the trimmings aside- you’ll use them for the garnish. Cut the leeks in half lengthwise, but do not cut all the way through the root end- the leek halves should still be connected at the base. Rinse the leeks under running water, fanning out the layers to rinse away any dirt that might be trapped there. Set the leeks aside. Fry the diced bacon in a small dutch oven (3-4 quart) over medium-low heat, until crispy. Remove the bacon with a slotted spoon and drain on paper towels. Transfer 1-2 teaspoons of the rendered bacon fat to a 9×9 inch baking or gratin dish and use a pastry brush to grease the pan with the hot bacon fat. Save the remaining bacon fat for another day. Add one cup of chicken stock to the empty dutch oven and turn the heat up to high. Bring to a boil and scrape up the good crusty bits from the bottom of the pot with a wooden spoon. Turn off the heat. Stir in the smashed garlic clove and chopped lemon thyme. Place the cleaned leeks in the greased baking dish. Sprinkle with kosher salt, pepper, and the crispy bacon. Pour the chicken stock mixture over the leeks. Cover the baking dish with foil, and place in the oven to braise for 30 minutes. After the first 30 minutes, use tongs to flip the leeks over to the other side and recover with foil. Braise for an additional 30 minutes, or until the leeks are very tender. Meanwhile, make the fried leek garnish (recipe below). Remove the baking dish from the oven and let cool briefly. During the cooling time, add the remaining two cups of stock to the dutch oven you used earlier and bring to a simmer over low heat. Puree the leeks and braising liquid in a blender along with a ladle-ful of the stock from the dutch oven. (I know it seems weird to puree bacon, but trust me on this! You’ll have tiny bacon particles dancing through your soup- it’s awesome!) Transfer the puree to the dutch oven with the rest of the simmering stock. Bring the soup to a simmer, and then remove from heat. Stir in the heavy cream and lemon juice, and add salt and pepper to taste. Garnish with fried leeks. While the leeks are braising, prepare the fried leek garnish. From the tops of the leeks that you trimmed earlier, remove the outer layers until you get to the lighter green, more tender center. Slice these tender bits thinly, lengthwise, so that you’re left with little strips of leek. These should be about 2 inches in length, so cut them in half if need be. Rinse these to get rid of any sand, then pat dry. Heat the oil in a small skillet over medium-high heat until shimmery. Toss the leeks and the flour in a small bowl. Shake off any excess flour and drop the leeks into the hot oil. Fry until the leeks just begin to turn golden- they should still be mostly green. Remove from the skillet and drain on paper towels, and sprinkle immediately with salt.